After reading this graphic, posted in an atheist internet community, I started thinking about the hundreds and hundreds of church services I’ve attended in my years on this planet. I tried to find recall one occasion where a pastor or church leader “demanded” money from me or anyone else. Just one. Am I saying it’s never happened? Not at all. I’m sure there are despicable hucksters out there, using “religion” (a nasty term that I would never use to describe a person of real, serious faith) to guilt people into financing their cadillacs and acreage estates. Indeed, turn on the TV any Sunday and you can watch some of them in action. But let’s be realistic: these shameless fraud artists exist everywhere in this broken world. And it’s safe to write that some of them are atheists. 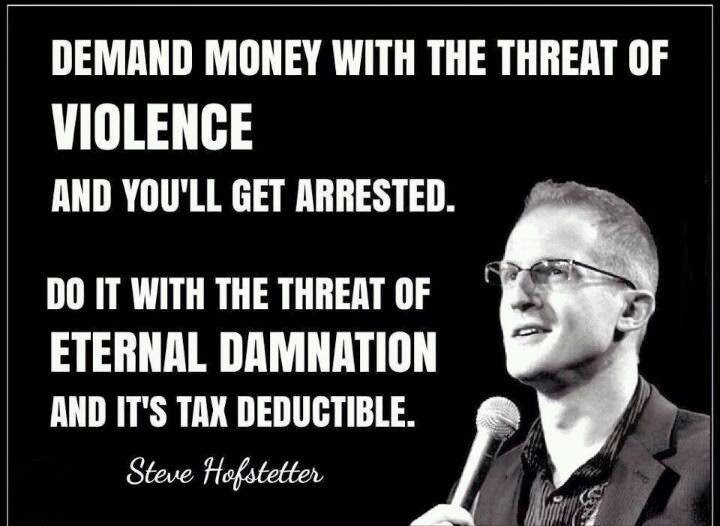 There’s another point being made in this graphic that can’t go unaddressed: the notion that somehow, tossing cash at a “religious” leader will somehow dispose of the “threat of eternal damnation”. This makes sense only if you believe God is a greedy, small-minded, narcissistic hypocrite. And if that’s the case, why are you reading this essay? “Come near to God and he will come near to you” (James). “God loved the world so much that He gave His only Son, so that everyone who believes in Him would not be lost but have eternal life” (John). That last statement makes it clear how to have a relationship with God. Believe in His Son, follow His Son, trust in what His Son did for YOU (dying on a cross to make up for all the wrong things you’ve done and all the right things you’ve failed to do). Do that, and all the other things that God wants will start to come easier. And you don’t have to give anyone a single dollar. Atheists habitually hallucinate an absurd alternate reality, call it Christian and then expect the real Christian to defend the absurdity. Back in the day (Socrates et al) such lame rhetorical tactics were called sophistry. I love your postings. They are so helpful in ministering the Gospel. Thanks brother Frank. Hosannas to Jesus Christ! If God wants us, why aren’t we there from the very beginning? Why create us in a state of being where we have to seek him? 1. We WERE there at the beginning. And we chose to turn our backs on God, walk away and do things our own way. The state of today’s broken world shows the results of that decision. Why would God let us turn away and then see if we turn back again? For entertainment? And if God is omnipotent, can there be such a thing as free will? 1. The reason is freewill. He wants a REAL relationship with us, the same kind of relationship we have with our spouses, parents and children. 2. Yes, freewill can and does exist with an omnipotent God. How? I don’t know. And I’m fine with that; I need reminders that God is God and I am NOT. This is one of those reminders.